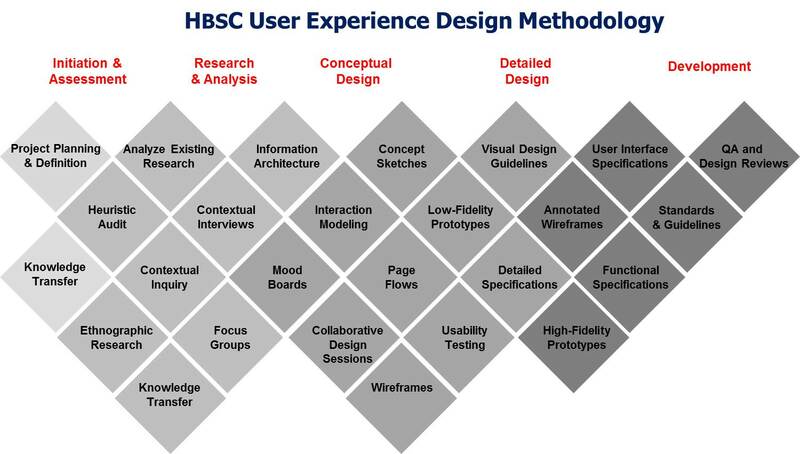 HBSC is recognized as a thought leader in helping companies create award winning User-centric UX Designs. Our design capabilities include Web, Mobile, Social Business and IoT Devices. By creating highly intuitive designs and deploying proven user interface best practices, we help organizations create or drastically improve their mission critical applications. Our multi-disciplinary teams and customizable UX Design Methodology help organizations ensure rapid user-adoption and successful product evolution. Gartner, the world’s leading information technology research and advisory firm, has ranked our web and mobile design work #1 in multiple categories. Our services help clients Build, Extend and Innovate their product and service offerings to rapidly increase market share. As part of our Digital Discovery offering, we facilitate strategic planning and execution of best-in-class initiatives that are designed to not only understand operational pain-points, but also delight customers. This often involves a multi-faceted approach of truly understanding customer behavior through ethnographic research, storyboarding and journey mapping. We staff our client teams with experts in Product Management, Mobile Technology, User Research, Human-Computer Interactive Design as well as highly creative Visual Designers. 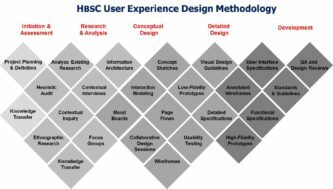 Our experienced project teams work closely with clients to customize HBSC’s User Experience Design Methodology for maximum impact. Using our customized toolkit of research and analysis techniques, we help clients innovate their new product applications using the latest Mobile-first design patterns. Our comprehensive and unique methodology along with highly talented multidisciplinary staff ensure your success. User Experience Services – Drawing upon a wealth of User Research, UI Design, eCommerece Strategy and Web Operations experience, we help our clients create viable Omni-Channel strategies. Our consultants focus on evaluating existing capabilities, improving online branding and transitioning customers to an improved user experiences. User Research – With increased customer focus on usability, we assist clients in evaluating new technologies that leverage the latest infrastructures. Our Consultants help generate new interactions with customers and transform the way services are delivered. The goal is always to improve customer loyalty, reduce UI inefficiencies, increase information access and improve the overall user experience. Customer Experience Architecture – With higher expectations from end-users for more intuitive software, the opportunity exists to gain market share from competitors through exceptional user interfaces. Leveraging best practices, innovative technologies and well thought out analytics, we help clients improve end-user adoption and customer satisfaction. User Interface Design – With the increasing cost of talented programmers, significant opportunities exist to improve user experience quality by doing things right the first time. By using UX best practices, innovative user research techniques and insightful user adoption strategies, we help clients quickly improve their on-line brand image. UX Assessment – Our team conducted a UX Assessment for a major insurance company to improve customer collaboration and usability. We collected and evaluated key usability metrics and recommended efficiency and cost reduction strategies. Each of the program initiatives delivered substantial economic value. UX Research and Redesign – For a large Financial Services company, we rationalized their current online and mobile service offerings to better target specific customer segments. Our Team collected and analyzed usage data to determine potential community improvement opportunities. We provided advisory services focused on improving customer collaboration, workflow and designed a full-scale self-administration capability. In-Context User Research Project – Conducted in-depth contextual inquiry and heuristic audit of a leading online Health Care portal. Worked collaboratively with senior executives and product management team to establish strategic objectives and leverage the power of Service-Oriented Architecture to enable new functionality across disparate applications and user interfaces. Online and Mobile Product Design – Collaborated with an innovative VMS company to develop their next generation online and mobile applications suite. After the initial UX Heuristic Assessment was completed, a customized UX Research and Design approach was implemented for 4 separate applications as well as native apps on iOS and Android tablets. The next wave of innovation from Social, Mobile, Analytics and Cloud Technology is already here – A revolution towards collaboration, improved interaction, increased information access and new products all being facilitated by next generation user interfaces. Organizations who lead this revolution have a massive opportunity to achieve significant advantage and deliver on the goals of their internal and customer stakeholders. If you are thinking about beginning or extending a User Experience initiatives at your organization, the our UX Team can help. For more information please send an email to client-development@hbsconsult.com. We help organizations transform their customer experience and brand by designing innovative online, mobile and IoT device applications. Our world-class design services help organizations develop creative ideas into winning products that go on to dominate the marketplace. Many of our web and mobile designs have achieved the top spot on Gartner’s Magic Quadrant and provide our Clients unfettered sales potential in their marketplace. Our UX Design Approach helps clients maximize ideal generation and then our team focuses on turning those ideas into new industry leading products. Our proven research methodology provides decision makers with a holistic view of their customers’ desires, behaviors, day to day product interactions and out-of-the-box ideas that push the design envelop. We work very closely with our clients to comprehensively analyze existing user data, ideate User Experience concepts and synthesize marketing winning designs. Client had a history of exceptional client service; however their VMS SaaS technology platform had become outdated and was a strategic disadvantage during the sales process. The software technology had grown organically without proper IT governance or UX design knowledge and was a significant contributor to inefficient business processes, poor customer experience and lost business. Best-in-class Software Platform – Client achieved the Magic Quadrant status for their software and mobile applications. Improved Internal Operations – Automated workflow improved efficiency and greatly expanded the service organization’s scalability. Launched Mobile Application Strategy – Client launched best-in-class mobile applications on iOS and Android platforms. Internal Cost Savings – A competitive advantage was achieved through a 40% internal labor cost savings. Increased Sales – Software and service sales increased 50+% due to improved application designs and improved user experience.